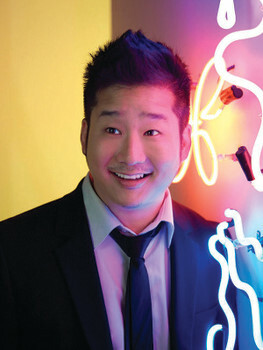 Join TAP-Chicago for a fun night of stand up comedy with the (in)famous Bobby Lee! Best known from his numerous years as a cast member on Fox’s long running comedy series “Mad TV”, Bobby can now be seen as a regular guest on E!’s “Chelsea Lately” and “The Daily Habit” on FUEL Tv. Currently shooting the feature film “Cooktales”, Bobby has also been touring the country year-round with his hilariously unpredictable stand-up act. A native of San Diego, CA, Lee was expected to follow in his father’s footsteps, running the family clothing store. After stints in a local rock band and at the local community college, he was spotted by Frank Burns, the legendary manager of La Jolla’s Comedy Store. In 1995, Pauly Shore spotted Lee on stage and asked the young comedian to open for him in Las Vegas. It was at that point that Lee met Shore’s mother, the celebrated owner of the Comedy Store, Mitzi Shore. Lee became a regular at the club, and also went on the road with the comic Carlos Mencia. Bobby went on to gain success from there, including landing a cast role on MADtv. Joining the show in 1999, Bobby quickly became an audience favorite on the long-running sketch show, which in total air for 14 seasons on Fox. Bobby became known for his unique brand of pain-inducing, physical humor. Lee’s film credits include “Kickin’ It Old School” and “Killer Pad”; both features will be released later this year. In summer 2004, he appeared in the big screen comedy “Harold & Kumar Go to White Castle” and in the Christmas sequel of the film in 2011. Lee also appeared in “Curb Your Enthusiasm” and “Mind of Mencia,” and has performed stand-up on “Late Friday,” “Premium Blend” and “The Tonight Show.” He currently lives in Los Angeles.